The International Fusion Materials Irradiation Facility, also known as IFMIF, is a projected materials test facility in which candidate materials for the use in an energy producing fusion reactor can be fully qualified. IFMIF is an accelerator-based neutron source that produces, using deuterium-lithium nuclear reactions, a large neutron flux with a spectrum similar to that expected at the first wall of a fusion reactor. The IFMIF project was started in 1994 as an international scientific research program, carried out by Japan, the European Union, the United States, and Russia, and managed by the International Energy Agency. Since 2007, it has been pursued by the Japanese Government and EURATOM under the Broader Approach Agreement in the field of fusion energy research, through the IFMIF/EVEDA project, which conducts engineering validation and engineering design activities for IFMIF. The deuterium-tritium fusion reaction generates mono-energetic neutrons with an energy of 14.1 MeV. In fusion power plants, neutrons will be present at fluxes in the order of 1018 m−2s−1 and will interact with the material structures of the reactor by which their spectrum will be broadened and softened. A fusion relevant neutron source is an indispensable step towards the successful development of fusion energy. Safe design, construction and licensing of a fusion power facility by the corresponding Nuclear Regulatory agency will require data on the materials degradation under neutron irradiation during the life-time of a fusion reactor. The main source of materials degradation is structural damage which is typically quantified in terms of “displacements per atom” (dpa). Whereas in the currently under construction large fusion experiment, ITER, structural damage in the reactor steels will not exceed 2 dpa at the end of its operational life, damage creation in a fusion power plant is expected to amount to 15 dpa per year of operation. None of the most commonly available neutron sources are adequate for fusion materials testing, for various reasons. The accumulation of gas in the material microstructure is intimately related to the energy of the colliding neutrons. For steels, the 54Fe(n,α)51Cr and 54Fe(n,p)54Mn reactions are responsible for most of the protons and α-particles produced, and these have an incident neutron energy threshold at 0.9 MeV and 2.9 MeV respectively. Therefore conventional fission reactors, which produce neutrons with an average energy around 1-2 MeV, cannot adequately match the testing requirements for fusion materials. In fact the leading factor for embrittlement, the generation of α-particles by transmutation, is far from realistic conditions (actually around 0.3 appm He/dpa). Spallation neutron sources produce a wide spectrum of energies, up to the order of hundreds of MeV, leading to potentially different types of defects in structures. They tend to generate light transmuted nuclei that intrinsically affects the targeted properties of the alloy. Ion implantation facilities offer insufficient irradiation volume (maximum values of a few hundreds µm thick layer) to carry out standardized mechanical property tests. Also the low elastic scattering cross section for light ions makes damage levels above 10 dpa impractical. 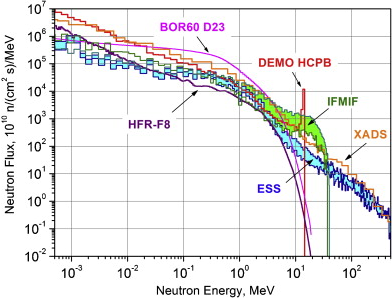 The d-Li reaction exploited for IFMIF is able to provide an adequate fusion neutron spectrum as shown by the comparison of IFMIF with other available neutron sources. In summary, due to the sensitivity of materials to the specificities in the irradiation conditions, such as α-particle generation/dpa combined with damage levels of above 15 dpa per year of operation under temperature controlled conditions, material tests require the neutron source to be comparable to a fusion reactor environment.